It is nearly impossible to know where our food comes from and how it is grown. Most of us even have trouble identifying the plants that produce the veggies, fruits, herbs, and grains that we eat each day. Our modus operandi is just to avoid thinking about the origins of what we eat. We probably wouldn’t like the answer, anyway. In recent years, we have seen a promising resurgence of interest in how our food is produced and distributed. Enterprising authors, filmmakers, academics, and others have attempted to shed light on the obscure world of food in the US. It remains to be seen what effect this movement will have on the majority of people who can’t afford farmers markets and organic grocery stores – that is, beyond now having the freedom to pass up “healthier” options at fast food restaurants. A few days ago, I stumbled upon an article reporting the results of two surveys that found a majority of Americans want changes to agricultural subsidies and more healthy food options. I am suspicious of any survey asking about agricultural subsidies — it’s a lot like asking people what they think of dark matter — but it is reassuring to know the current national dissatisfaction with everything doesn’t stop short of the food system. 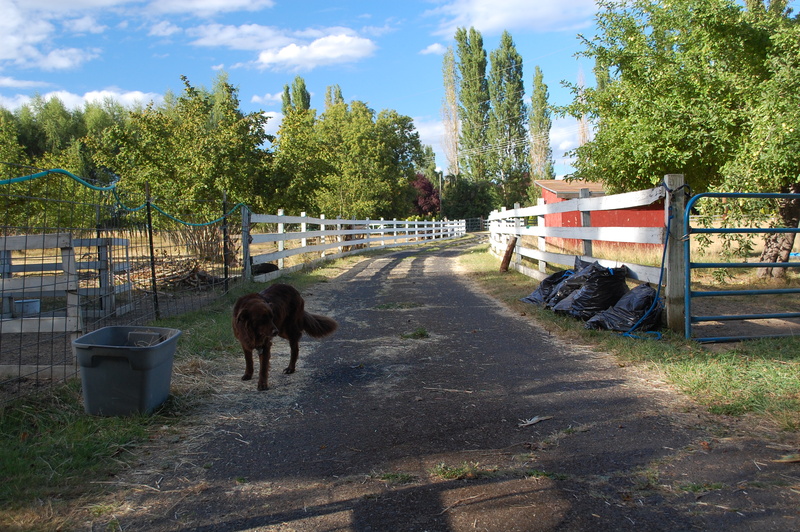 As for me, I purchased a dirt cheap $30-per-year membership to the WWOOF USA website hoping that wwoofing would give me a small window into how a local, commercial organic farm makes ends meet. While I learned many things – while memories of my time on the farm will endure – this did not happen. As I mentioned in a previous post, the farm where I worked is actually more of a homestead. It is not financially self-supporting; it relies almost exclusively on other sources of income. 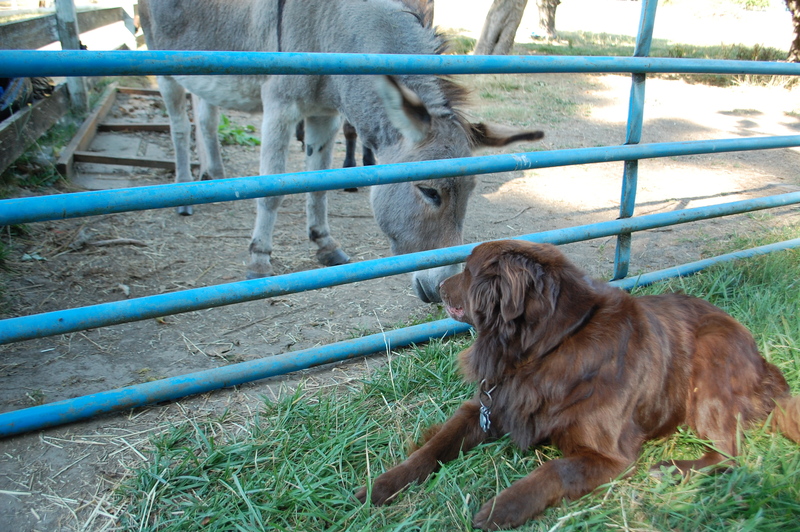 By the end of the two weeks, Barkley and the donkeys had forged a delicate peace. This, despite some initial turbulence that resulted in Barkley getting kicked in the snout. 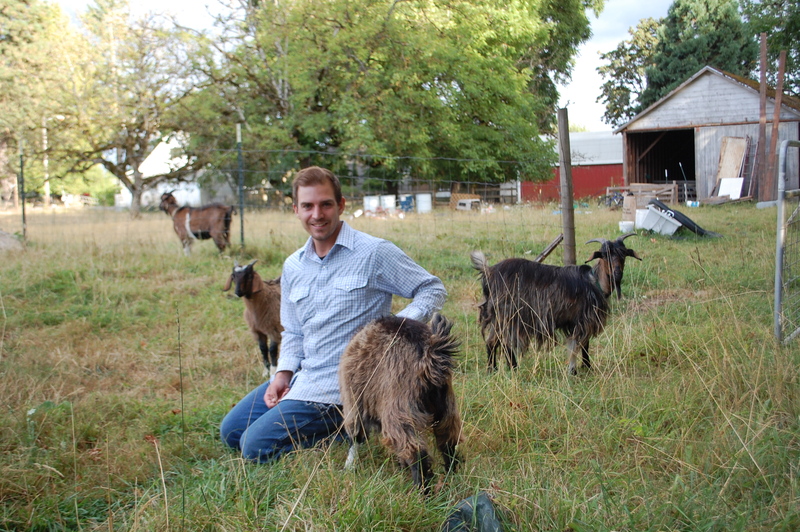 Had I been on a financially self-supporting farm, my experience would have been very different. Narusse the goat would have been made into a stew or sold years ago. There would be few animals that did not produce something of commercial value. I suspect we would have spent much more time harvesting vegetables, weeding the fields, putting together CSA boxes, readying goods for the farmers market, sorting through boxes of veggies, helping out in the greenhouse, etc. Also, most commercial farms favor longer-term wwoofers with more prior experience. And they would be very unlikely to allow a dog. I was very lucky to find Riverside Farm. The farm allowed me to do different types of work each day. In my two weeks there, I cut down a chestnut tree, made a large post for a shelter out of an old log, swam in the Yamhill River to remove and later to reinstall the irrigation pump, planted a cherry tree, buried a dead sheep, shoveled my fair share of llama and donkey dung, carried all kinds of objects to and fro, helped repair a chicken run, cut back a blackberry bramble, and moved a rooster from his coop to his “dacha” each morning. The author meets some new friends. And the greatest thing of all, I could work each day with my shaggy companion watching from the nearest patch of shade. Being on the farm also got me thinking of the elemental activities that made up each day. Pulling weeds, watering plants, harvesting vegetables, grappling with a goat — these are things our ancestors have been doing for 10,000 years since the dawn of agriculture. There is something truly grounding about waking up to dueling roosters, the bleating of a family of goats, the call of a hungry lamb. I never fussed over what ringtone to choose for my alarm on the farm. The animals made that decision for me. I could always hear the resident lamb in the morning, and sometimes even at night. Apparently, he is not above a quest for a midnight snack. September 6th, my fourteenth and final day on the farm. I was distracted. I had agreed to make a vegetable soup for Jackie, Tom, and Emily. I pressed the phone to my ear with my shoulder while I diced the potatoes, onion, and peppers, and asked after the latest news of home. Earlier, I had learned with dismay that large portions of the state of Texas was ablaze, including thousands of acres in the lost pines in Bastrop, about 30 miles east of Austin. Several hundred homes had been burned in Bastrop County, and the fires there were far from contained. Strong winds related to a distant tropical storm were fanning the flames and creating extremely dangerous conditions. Although the Bastrop fire was the most destructive and dangerous, fires raged across Texas. The hottest and driest summer on record had rendered much of the state a tinderbox. A spark and a gust was all it took to trigger a real conflagration. And I was 2,100 miles — no less than three full days of driving — from home. Worst case scenarios cycled through my mind as I chopped green beans, and I wondered how fast I could possibly return home while I de-seeded the jalapenos. It would be a “drive to end all drives,” I figured, which would also have to account for losing the two hours that separate the Pacific and Central time zones. A plan took form: 13-14 hours to Salt Lake City day one, 11-12 hours to Albuquerque day two, then 12-13 hours to Austin day three. Barkley, in particular, made a welcome home of the farm. He loved being able to run like his ancestors, untethered and free. Not a trace of the zucchini or anything else in the soup remained after dinner. I took that as a good sign. I said farewell to the friends I made on the farm, human and otherwise, and reluctantly set my alarm clock for 5:30am. “You’ll have plenty of time to sleep in the car,” I assured Barkley. The drive home was unspectacular. I never stopped to take any photos. The first two days, I drove from morning until I grew tired of searching for the white stripes in the darkness. A nondescript stretch of road somewhere in Eastern Oregon or Idaho. 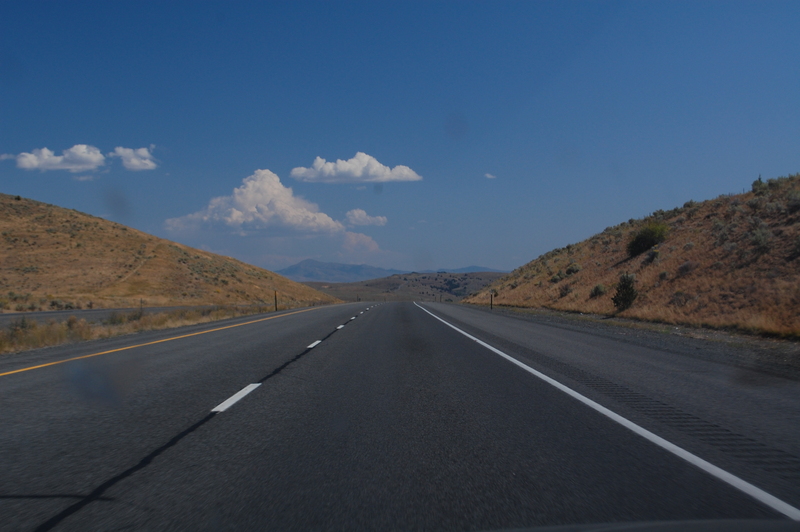 Traveling after Labor Day, empty highways were a common sight. On September 8th, around 6pm, I rolled into Austin. Although the worst days of smoke from the fires had passed, the unmistakable smell of burning lingered in the air. I thought of the opinion piece my sister sent me about the aridification of Texas. “If the models are right, then the Southwest will face a permanent drying out,” said one climatologist quoted by the author. With the first and second hottest months ever recorded in Austin separating September from the last significant rain, the possibility was hard to deny. In her first post on the farm, Kelly — a fellow wwoofer and talented photographer hailing from Los Angeles — gave an honest and entertaining treatment of her time in the red barn. In her latest post, Kelly provides an entertaining overview of the characters on Riverside Farm, complemented by excellent photo-documentation. 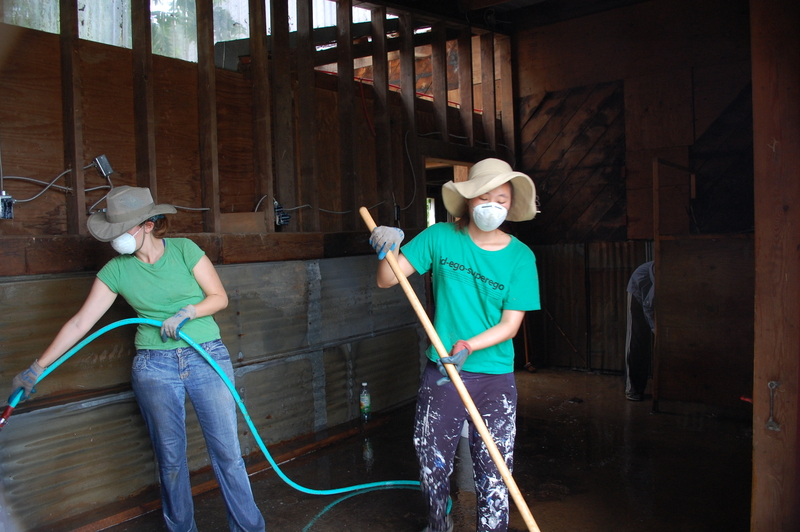 Among their many important tasks, the other wwoofers on the farm, Kelly, Emily, and Charlie were charged with the annual scouring of the chicken coop. That ominous job involved removing a year of soiled hay bedding and lime, scraping, soaking, and sanitizing several platforms that were caked with chicken poop many inches thick, and thoroughly hosing all surfaces. They all agreed it would be better not to break for lunch that day. 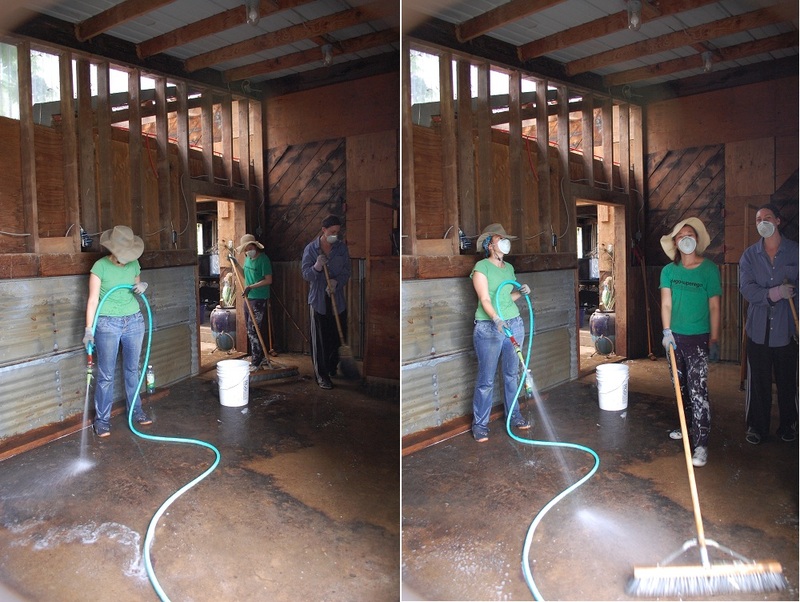 Kelly (left) and Charlie (right) hid smiles under those respirators, no doubt, as they participated in the annual cleaning of the chicken coup. Kelly, Emily, and Charlie hard at work in the coup. The illusion of the small-scale farm? I wanted to find out what being on a farm was like for myself, I explained. I don’t shy away from hard work. And, after 7 years of sitting at a desk in an office, the prospect of some honest labor had me rubbing my hands together in anticipation. And I admit that I have, from time to time, been one of those city folks my uncle bemoans — dreaming of being the king of my own little slab of land somewhere removed from the endless chatter of city life — overlooking the hardships of a life away from many of the urban opiates that placate my existence. But the shadows of doubt cast by the grueling work, potential dangers to life and limb, loss of conveniences, and other hardships did not fully darken my vision of one day having my own little farm. The truth is that I could never figure out the economics. 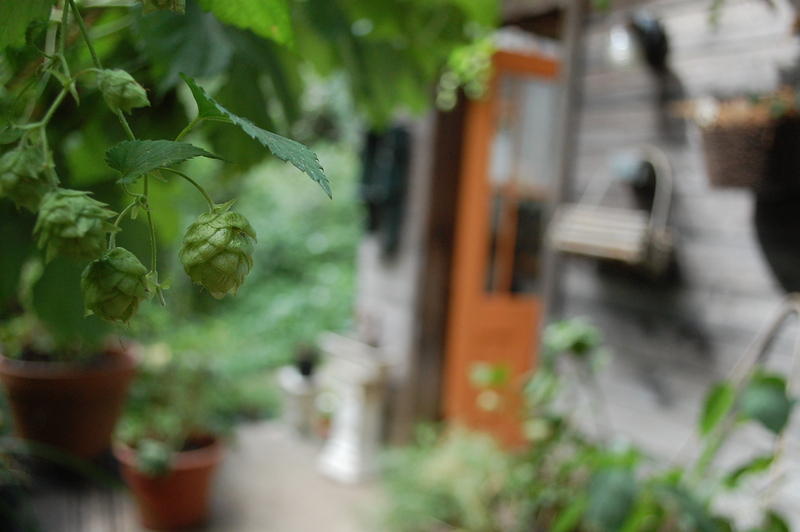 Hops growing on Riverside Farm. The Northwest is a lead producer of hops, used in the production of beer. The price of hops was $3.20 per pound in 2010. Many breweries have contracts with specific farms for a specific amount at a pre-arranged price. I have no idea how small-scale farmers make ends meet, and I’ll show you why. A prized hen, at the peak of her productivity, may lay an average of three eggs every four days, or about a dozen eggs every two weeks. As such, our prized hen may produce about $9 in eggs (2 dozen) per month, or $108 / year. This gross amount, of course, doesn’t include any costs from distributing the eggs to customers; organic feeds, which are expensive; clean water and quarters; raising our hen and feeding her for up to six months before she produces her first egg; and sickness, injury, or premature death. From my personal experience, I spent about $75 / year per hen for local, organic feed. A farm would be able to reduce costs by buying in bulk. Still, the organic feed I purchased cost over twice as much as comparable conventional feeds, and I bet a similar ratio applies to feeds purchased in bulk. Spending 50 cents to make a dollar, our hen would net us about $54 in profit over the course of a year. And this modest figure relies on very optimistic assumptions about productivity, costs, and uncontrollable events. In this scenario, you would need about 915 chickens to make the 2010 median household income of $49,455. In this video, Jackie’s good friend Sheryl helps her clean some wool in tumblers specially designed to clean animal fiber. We spent half the day cleaning wool that, according to Jackie, would likely sell for $100-$200 through craigslist. The wool came from an annual shearing of a few adult sheep. As an additional side note: while I have been referring to “Riverside Farm,” the farm is actually more of a homestead, since it is not financially self-supporting. Jackie relies on other sources of income to pay most of the bills. But, you might say, small-scale farmers are diversified. They produce many goods on one farm, not relying on a whole battalion of hens to make ends meet. I chose eggs as an example because they appear to be one of the better agricultural investments: they require less machinery and other expensive implements than many vegetables, demand for them is steady, they are relatively stable through weather events like droughts, and they seem to have a much better profit margin than many veggies. This chamomile shows one of the financial hurdles that plague small-scale farms. 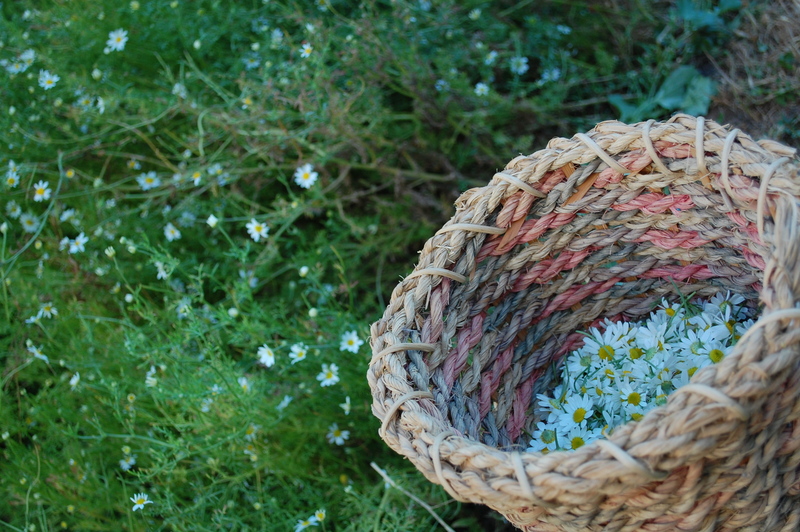 While the chamomile could be sold for a decent price, the farm does not grow enough to make it worth marketing and distributing it to a buyer. I don’t think going through the exercise above using lettuces, chilis, potatoes, brassicas, fruits, or any combination thereof would change the result much. The fact is, you’ve got to sell agricultural commodities in great quantity to make it as a self-supporting, commercial farm — an imperative few small-scale farms can satisfy. As I mentioned in my first post on the farm, there were three “wwoofers” working at Riverside when I arrived. One of the wwoofers, Kelly, was a talented photographer hailing from Los Angeles. In her latest blog post, Kelly gives an honest and entertaining treatment of her time in the red barn, which served as quarters for the other wwoofers (but not me and Barkley; we slept in a separate, refitted caravan overlooking a ravine). Spiders, bats, swallows, and old, creepy dollhouses — the barn wouldn’t have been the same without them. 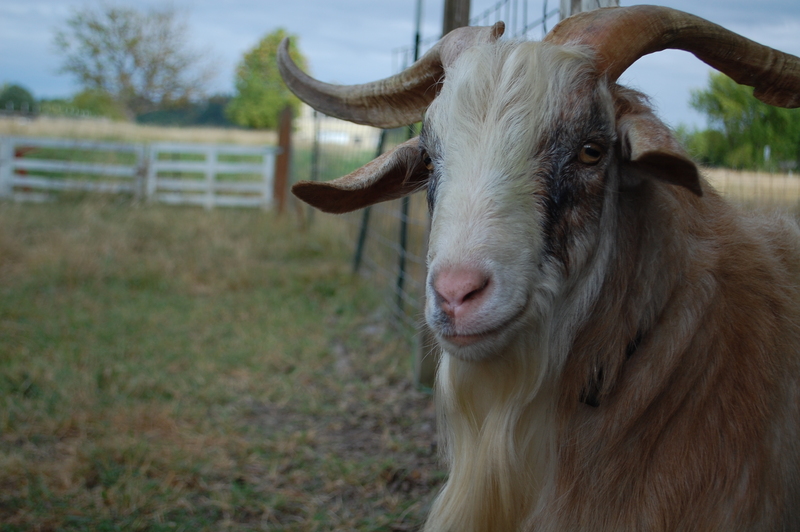 Moving Narusse’s designated goat-wife, Mocha, into his enclosure did not improve his disposition. It did, however, succeed in making her miserable. As soon as she finished devouring the greens we used to lure her into her new pasture with her goat-husband, she wanted out. She took to pacing from one corner of the pasture to another, calling for her family — four kids from two pregnancies, who previously shared a pasture with her — and wistfully peering into their enclosure. 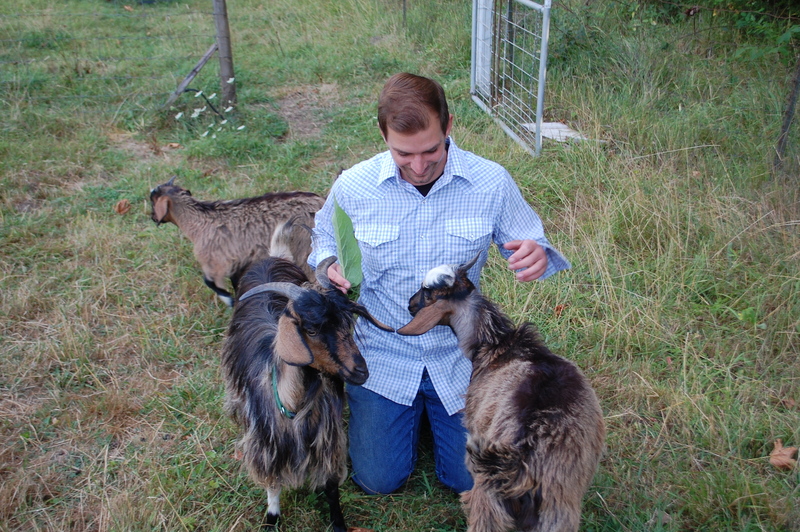 Mocha the goat (in the background) with her family, prior to being forcibly reunited with her "husband"
And still, the ever-tempestuous Narusse stormed any visitor who dared enter the pasture he now shared with his disaffected wife. This became a problem when Tom decided to enlist my help working on a structure in the pasture he currently occupied. We would get in a few swings of the hammer while working, but then we’d have to scan the pasture for the belligerent goat. And take evasive action if he got too close. Jackie decided to temporarily move Narusse to the donkey pasture. 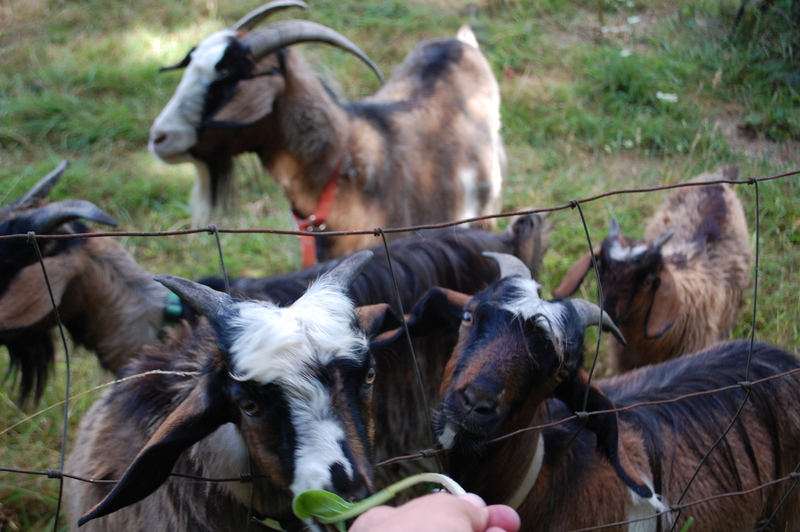 Having the goat around irked the donkeys, who shied away from the shaggy, horned curmudgeon. But it did seem to bring some relief to his wife, who was now alone in the pasture next to her offspring. The next day, I overheard Tom and Jackie discussing the goat. “Well, maybe someone would want to process him for meat,” Jackie said. “Jackie, are you serious? No one would want him for that, he’d be much too tough” Tom replied. On the advice of an employee at the local feed store, they decided to buy a large, thick rubber ball for the goat to headbutt to release some of his aggression. On my last day on the farm, I caught a glimpse of the unblemished green ball at rest in the pasture grass in Narusse’s enclosure. 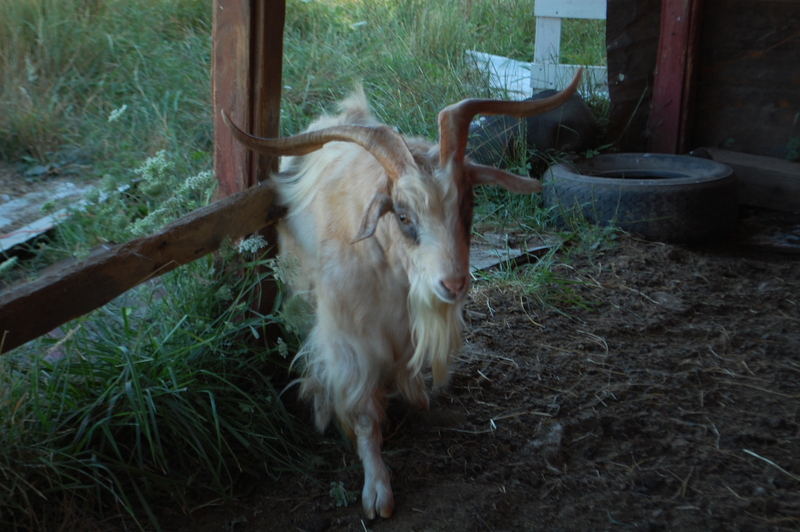 When the pugnacious goat saw me, he immediately started raking his horns against the fence post. A muffled clank resonated as the goat brought his thick, curvaceous horns crashing down against the crowbar. With my right knee in the pasture grass, I braced myself, gripped the steel bar as tight as I could, and pressed it horizontally against his horns — putting all my weight against the force of his charge. With a thrust of the crowbar, I pushed him away. My most commanding tone mattered little to the goat. He reared up onto two feet, raising his horns to a height of almost five feet, brought his weight down on his front hooves with a “whoomp,” and came at me more determined than ever. I brought up the crowbar to meet him again, head on. Narusse The Goat didn't have many visitors. And that's how he liked it. “Just a few mahre minutes,” said Tom kneeled over a wrench, struggling to loosen the flow valve between the irrigation line and the sprinklers. My weight was insufficient to hold the goat. He charged again and again, each time pushing me a few steps backward toward the fence enclosing the pasture. On the other side of the fence, from the shade of the garden, Barkley watched like a detached Roman emperor in the box seats of the Coliseum. The sweat stung my eyes, and I could not spare a hand to wipe it from my forehead. I was losing the battle. “Almost theyah,” he replied, laboring through the last few turns of the valve. The goat reared again and landed with another muffled “whoomp” that vibrated through the ground around my feet. This time when he came at me, I threw the crowbar down and grabbed his horns, one hand on either side of his face. Some ancient instinct came to life then and told me to push down, a move that redirected the force of his charge and drove his head toward the ground. I held him this way for a few minutes. The problem was that I had to release him eventually. And when I did, he came after me again. But at least I now faced the beast with the knowledge of how to temporarily disable him. 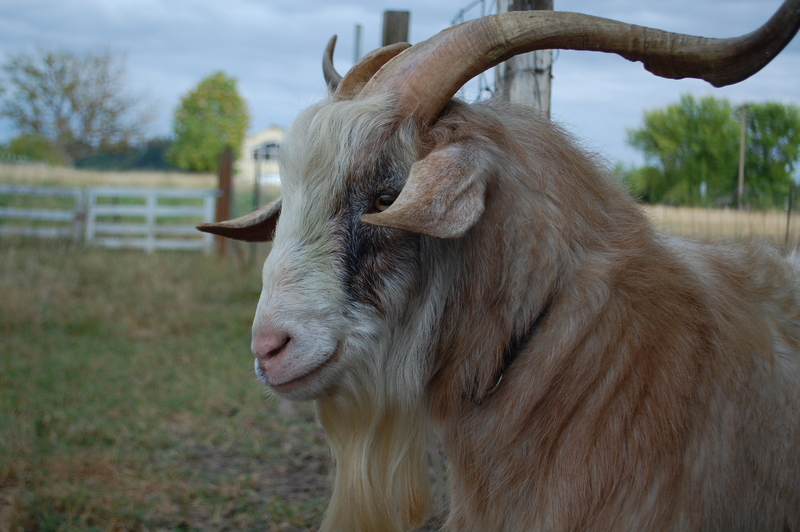 Frustrated, the goat turned his vitriol against Tom, who had just finished the task at hand. I was quietly relieved. “Okay. Let’s go,” he panted, he breath strained from grappling with the enraged goat. The sprinklers were once again chattering noisily in the field, proof that the irrigation system was back online. We slowly retreated to the gate, Tom restraining Narusse by his horns while I carried the crowbar and other tools we had brought out to fix the irrigation system. I opened the gate and slipped through. “Okay, we’re all clear,” I announced when the tools were safely out. Tom put all his weight into thrusting Narusse a few steps backward and ran for the gate. The goat launched after him. We latched the gate just as he brought his horns crashing into it.